Dogs are naturally playful and curious, ready to explore new places and curious about anything that moves. Because of their playful nature, they are often at risk of bee stings. Dogs usually explore the world with their noses, so they mostly get stung in the face. If they are unlucky, they can get in contact with a nest which can result in multiple stings. The danger of bee sting is not the pain but the possible allergic reaction. Knowing how to take care of the sting and being able to recognize an allergic reaction can save your dog’s life. Most bee stings are a localized pain and irritation so you can notice if your dog has been stung. The most common places for stings are dogs face or toes. If you notice your dog pawing at his face or licking his toes, be sure to check them for stings. An allergic reaction is the greatest danger of a bee sting, it can be very sudden and lethal for your dog. Monitor your dog closely and watch out for any excessive swelling, difficulty breathing, weakness, and disorientation. Be wary that these symptoms may not manifest at the same time or even right after the dog has been stung, an anaphylactic shock can occur within 24 hours of the incident. If you notice any signs of an allergic reaction, take your dog to a vet immediately. The stinger should be removed as soon as possible to reduce the amount of venom injected. But, be careful with how you take it out. A bee stinger works like a syringe with a hypodermic needle, some venom is injected right away while the rest is slowly released as long as stinger is in the skin. While trying to remove the stinger, you should avoid pumping more venom so do not try to use tweezers or your fingers. The best way is to scrape out the stinger with a credit card, fingernail, or a coin. Even without an allergic reaction, the swelling around the area of the sting will occur. The best way to alleviate the itchiness and pain is to apply ice over the swollen area. You can wrap the ice cubes in a clean towel or use an ice pack and place it over the sting. Keep it on for as long as your dog can tolerate. If your dog got stung in the mouth or throat, take him to the vet as soon as possible. The swelling in the mouth and throat can block your dog’s airways and cause suffocation. A vet can give your dog medication and safely remove the stinger. The level of pain depends on the severity of the sting and its location. Mild stings can feel itchy and burning while stings on the face or in the mouth can be very painful. A natural remedy for pain relief is a mixture of baking soda and water, soak a cloth with the mixture and put it over the sting. Another option is to take your dog to the vet who can give him pain medication. Because of dangers from the allergic reaction, antihistamines are usually the first aid choice in case of bee stings. Benadryl (Diphenhydramine) is an over the counter antihistamine drug that is tolerated by dogs. If you notice signs of an allergic reaction, you can use Benadryl pill or injection. The dose is calculated according to the weight of the dog, usually 1 mg per pound of body weight. If you are not sure about the dose, contact your vet. Even if you have given your dog a dose Benadryl, you should take him to the vet. Your dog will need a follow-up care, and only a qualified professional can do it properly. If your dog has been stung multiple times, you should give him antihistamine medication and take him to the vet immediately. Larger doses of bee venom can threaten vital organs and systems which requires prompt and aggressive treatment provided by the vet. And if you know that your dog is allergic, you should always carry an epinephrine (adrenaline) pen with you in case of anaphylactic shock. An anaphylactic shock can be recognized by pale gums and vomiting 5-10 minutes after the sting. When you are taking your dog for a walk, you should pay attention to your surroundings, especially if you live close to known bee habitats (flower beds, trees with bee nests, human-made beehives, blossoming trees, and bushes). Try to keep your dog from sniffing around flowers and other areas where bees might be present. 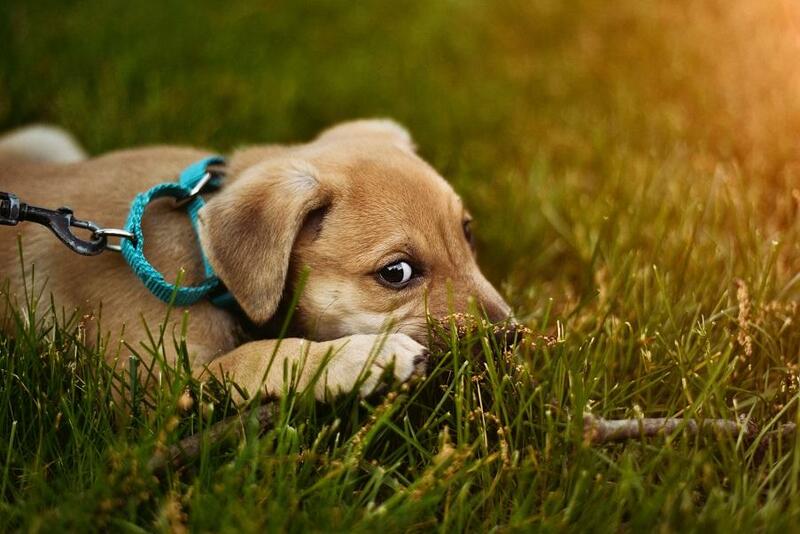 Keep an eye on your dog even if you let him run around your yard. Always carry a first aid kit with antihistamine and epinephrine, and have your vet’s number memorized on your phone. If a sting does happen, stay calm so you can give the best help to your four-legged friend. Read more: How long does a bee live?